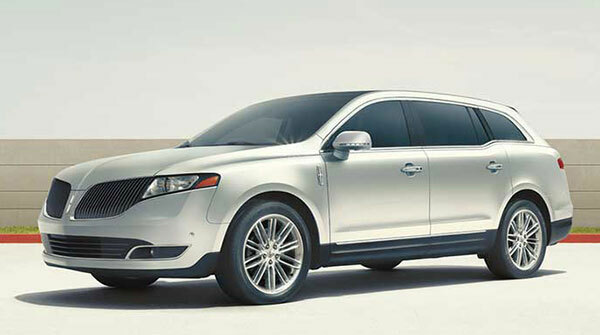 Despite its capability for passenger-hauling, the Lincoln MKT three-row crossover SUV hasn’t made much of an impact since its 2010 debut. Limousine services like it, but retail customers tend to turn away. While excelling in comfort and utility, the MKT falls well short in eye-appeal. Few regard it as attractive, while many might call in ungainly, if not downright ugly. Nothing of consequence has changed for the 2018 model year, except for some new colors and newly named trim levels. In fact, the MKT has seen minimal change through its lifetime. Almost reminiscent of the barge-like Lincolns of the distant past, the MKT is actually an offshoot of the boxy, far more popular Ford Flex, wearing its own sheetmetal. Two trim levels are offered: Premier and Reserve. Beneath Premier hoods, a standard 3.7-liter V6 develops 303 horsepower. The Reserve edition gets a twin-turbo 3.5-liter V6 that generates 365 horsepower. Both versions use a 6-speed automatic transmission. Premier models come only with front-wheel drive, while the twin-turbo engine mates with standard all-wheel drive. Infotainment is top-notch, making good use of Ford’s intuitive Sync 3 system, which includes Apple CarPlay and Android Auto. Advanced safety technology is one area in which the MKT falls short. Only the Reserve edition can be equipped with such technology as collision warning, lane-keeping, and adaptive cruise control. Rather than standard, those items are offered in a $2,000 optional Technology package, which also included active park assist. Blind-spot monitoring with rear cross-traffic alert is standard in the Reserve model. Automatic emergency braking is not available at all, though it’s offered on many other 2018 vehicles. Six airbags and a rearview camera are standard on each MKT. Inflatable rear seatbelts are optional. Unfortunately, those belts are uncomfortably bulky, as well as incompatible with some child car seats. The National Highway Traffic Safety Administration, an agency of the federal government, has not crash-tested an MKT. In its crash-test program, the Insurance Institute for Highway Safety gave the MKT a Good score for the moderate front overlap collision, and for several other factors; but that agency has not subjected an MKT to the more challenging small-overlap test. In addition, MKT headlights were deemed Marginal. MKT Reserve ($49,025) upgrades to a twin-turbo 3.5-liter V6 with all-wheel drive. Standard features also include an adaptive suspension, heated steering wheel, navigation, THX II-certified audio system, power-folding third-row seats, and blind-spot monitoring with rear cross-traffic alert. Heated/cooled second-row bucket seats are available. Only a glance is needed to realize that appearance isn’t a prime selling point for the MKT. Unless they’re impressed by the big crossover’s utility value and potential comfort, observers are far more likely to call it ungainly or homely than pretty or enticing. Engines and underpinnings are shared with Ford’s defiantly boxy Flex, but sheetmetal definitely is not. While the distinctively familiar Flex has aged nicely through the past decade, the MKT remains burdened with an almost lumpy-looking physique, led by a protruding snout. Overall appearance harks back to some earlier Lincolns, and the design seems wholly out of step in 2018. Roomy and comfortable inside, the MKT promises ample space for up to six passengers. Nothing about the interior could be called sleek or modern. Trimmed with wood and leather, the cabin looks somewhat outmoded, yet emits a soothing aura. Standard Bridge of Weir leather upholstery raises the luxury level. Front and second-row seats qualify as sumptuous, like those in Ford’s Flex. Front occupants sit a little low, but benefit from well-padded cushions. In the second row, individual captain’s chairs can replace the usual three-place bench, reducing capacity from seven to six passengers. In either configuration, occupants can expect ample stretch-out room. Seating space is greater than expected in the third row, too, though getting there can be a challenge for adults. Although the dashboard layout is logical and orderly, if on the dull side, controls can be frustrating. Substituting for conventional buttons, capacitive-touch audio and climate controls convey a clean appearance, but don’t function as well as ordinary switches and knobs. The volume slider is especially troublesome. Sync 3 infotainment responds quickly, working from menus that are easy to sort through. Each model gets an 8.0-inch screen. Cargo space is bountiful, totaling 76 cubic feet when second- and third-row seats are folded away. With the second row upright, volume drops to 39.6 cubic feet. Raise both rows, and space amounts to 17.9 cubic feet. Performance is adequate with the base engine. Quiet and composed, the Premiere model is admirably muffled, ready for duty as a town car. Response from the Reserve’s twin-turbo is quite a surprise, augmented by its near-sporty exhaust note and firm, communicative steering. Impressive twin-turbo acceleration manages to give the MKT a personality that’s almost athletic in nature. A moderate stab at the throttle produces a veritable tornado of torque. The long wheelbase yields a comfortable ride, especially in Reserve models with their standard adaptive suspension. Standard 19-inch tires cope well with rutted pavement surfaces. Transmission in rival models may have more gears, but the MKT’s 6-speed shifts smoothly. Paddle shifters are included with Reserve trim. Coupled with the Reserve’s adaptive suspension, they help provide an unexpectedly sporty driving experience. Steering is direct and accurate, with a more natural feel than many crossovers, while body lean in corners is minimal. Fuel economy is nothing to boast about. In the MKT Premiere, the 3.7-liter V6 is EPA-rated at 16/24 mpg City/Highway, or 19 mpg Combined. The twin-turbo engine and all-wheel drive in the Reserve model is EPA-rated at only 15/21 mpg City/Highway, or 17 mpg Combined. Both MKT engines run on regular-grade gasoline. Look beyond its unconventional, often-derided styling, and an MKT can provide decent value for its class. Lincoln justifies the MKT’s relatively high price with an abundance of traditional luxury equipment, helped by the excellent Sync 3 infotainment system. Despite a couple of quirks, the MKT excels as a roomy and comfortable passenger hauler, a fact that limo drivers know well.